Spray a 13x9 inch casserole dish with cooking spray. Mix together cornbread mixes. Pour cornbread mix into pan and set aside. Brown the ground beef and drain. Add taco seasoning. 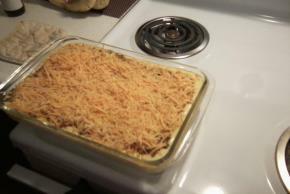 Evenly place the meat over the cornbread mix (don't stir) then layer corn, salsa and cheese. Bake at 350°F for 45 min or until cornbread and cheese is melted.